The sign at Herberger's entrance on Thursday said "Last 12 days," which means the stores are likely closing around Aug. 26 or so. Nearly everything is now 70 to 90% off with an extra 10, 20 or 30 percent discount. So does that mean that a sweater marked 90% off plus an additional 10% off is free? Unfortunately, no. Some bargain hunters may not be aware that additional discounts cannot be added together. For example, if a $100 sweater is discounted 90%, the new price is $10. The additional 10% discount is deducted from the $10 subtotal, which is $1. So a $100 item marked down 90% and 10% would cost $9. 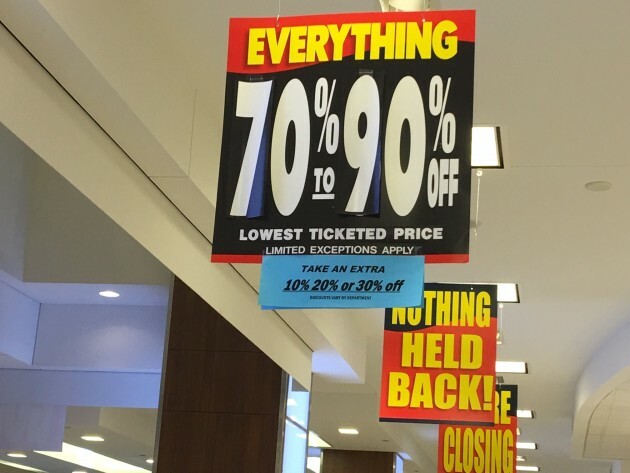 Retailers use Americans' fuzzy math to make a deal seem better than it is. A BOGO or "buy-one-get-one" offer is a good example of that. Initially, a BOGO usually meant that a consumer bought one item and got an identical second one free, a 50% savings. Then it began to change to "buy one and get another at 50% off." To some, that may sound like getting 50% off if two items are purchased. It's actually 25% off each because the first item is sold at full price and the second item is 50% off. For example, say a $10 bottle of detergent is on a 50% off BOGO. The first bottle is at $10 (regular price) and the second bottle is $5 (50% off $10). The total for both is $15 on a BOGO sale, regularly $20. That's only a 25% discount ($5) on the two bottles ($20 X .25= $5). Why do retailers like BOGOs? They want shoppers to buy more. Many, but not all, consumers realize that when ad says "10 ears of corn for $1," the consumer is not required to buy 10 ears unless stated in the ad. Whether a shopper buys two ears or more, they are still 10 cents each. But when an item is on a BOGO sale, the consumer is required to buy multiples to get the discount. Need low cost dental care? Try local clinics/schools.